The Mulan Society is a program aimed at strengthening immigrant women's family stability as they face challenging life transitions. The program takes place for 3 hours on Saturdays in a multicultural safe environment where the women become at ease sharing their experiences as they learn from English and computer instructors and workshop speakers. Additionally, these women can visit AACA during normal office hours for individualized support and case management. 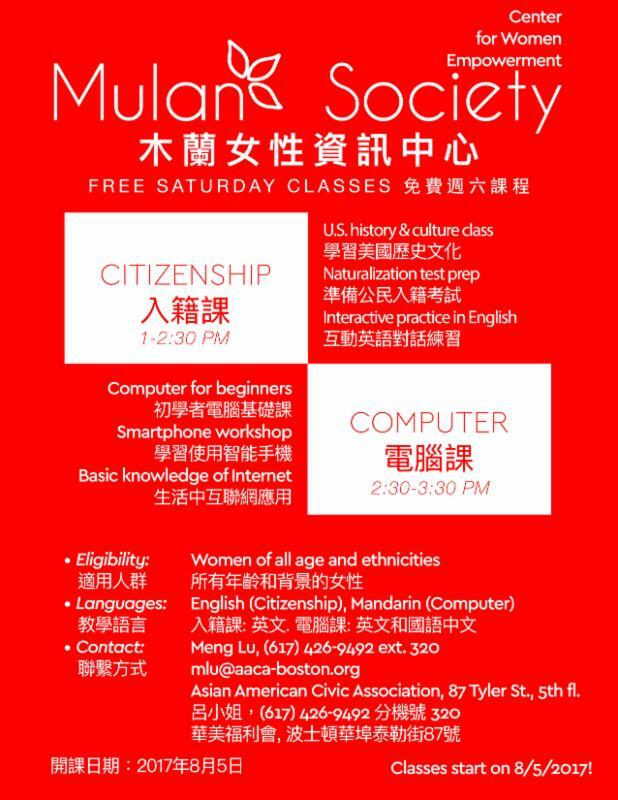 The Mulan Society Saturday sessions feature naturalization classes and basic computer classes, as well as guest speakers in workshops on topics identified as highly relevant to immigrant women and their families based on existing research, including but not limited to navigating the Boston Public School system as well as the healthcare system, domestic violence prevention, and career building, an area where immigrant women struggle to support their family's income as language and cultural barriers interfere. Participating women can learn about AACA's core programs and services including the Employment Center as well as the Multi-Service Center. The Mulan Society is essential for immigrant women so that they can join groups which provide growth opportunities and relief from isolation.